Sir Winston Churchill said, "The truth is incontrovertible. Malice may attack it, ignorance may deride it, but in the end, there it is." 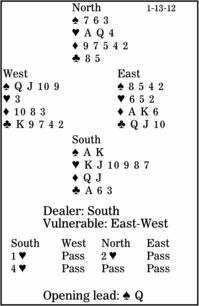 Bridge declarers must seek the truth -- incontrovertibly the right play. It will not always win, due to the vagaries of the cards, but if you always find the best line, you will be a winner. In today's deal, South is in four hearts. After West leads the spade queen, what is the truth, the right line of play? When I run this deal in classes, the majority adopt an incorrect approach. I cannot decide if you should get bonus points for working out what that is, or if it is better that it never occurs to you. South's jump to game was a tad aggressive, but he was -- no lie -- a member of the "if you smell a game, bid it" club. The "standard" line of play is: win with the spade king, cash the spade ace, play a trump to dummy, ruff the last spade in hand, and draw another round of trumps. Then, when the 3-1 break comes to light, declarer finally turns to clubs. When East wins a trick in that suit, if he is a good defender, he returns his last trump to kill both the club ruff and the contract. The better declarers see that they have four losers in their hand: two diamonds and two clubs. They also notice the shorter club holding in the dummy and that they can ruff a club. They take the first trick, cash the club ace, and lose a club. When they are back in their hand, they ruff their last club high, draw trumps, and claim.